What can Syndex do for investors? Syndex is making the private market more investable. 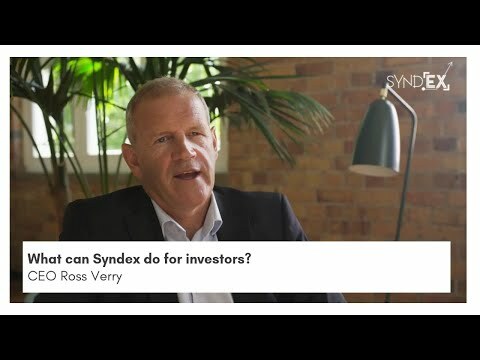 Here Ross, CEO, explains how Syndex has turned private market investing around and opened up access to real assets for investors. Syndex is creating opportunities to proportionally invest within a well-governed, transparent environment with the addition of access to a secondary market. [transcript] “We’re looking to solve a number of issues for investors. We want to give them access to interesting, alternative, privately-owned assets, for example you’ll see opportunities to invest in commercial property syndicates to proportionally invest in farms, orchards, vineyards and other privately-owned assets, perhaps those in their early stages [of development] or in a situation where they want to raise more capital to grow or to transition ownership. For the first time investors can get access to this asset class with the comfort that it’ll be well-governed, with good product information on which to make their investment decision. They will get ongoing performance information, operational and financial data and access to liquidity. They will know that if they need to sell their asset they can list it on the Syndex secondary market or the investment opportunities market. They will also have access to their own personal investor portal where they can see their investment portfolio; here they can administer the portfolio, trade, and receive all the information that is communicated to them by the investment manager or the syndicator. They’ll be able to operate their portfolio in a market that is fair, orderly and transparent and that is very competitive and they can buy and sell on the platform.